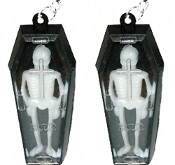 Gothic Vampire SKELETON in BLACK COFFIN EARRINGS - Party Favor Vintage Dracula Casket Vending Toy Jewelry - Really opens... Skeleton can be removed! Great for Halloween, Pirates of the Caribbean Lover and Pirate Collector. Realistic, detailed Plastic Skelaton in Black Coffin Charm, approx. 2-inch tall x 3/4-inch wide.